Gerbera Daisy Diaries: Did You Know? 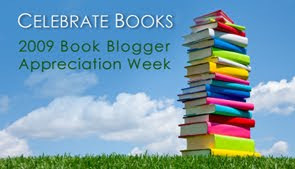 That it's Book Bloggers Appreciation Week? There are TONS of book bloggers out there -- I follow a few (they are on my sidebar). It's too bad you can't vote on blogs that aren't listed. I really like Reading for Sanity's reviews and Lucy at Life Is A Spasm Who Flow, both have some of the best reviews out there, but aren't listed as candidates. Too bad. But here is there Q&A for today -- I thought it was a fun! I usually read at night, after dinner, when the kids are in bed. So, no, I don't snack...plus, crumbs in a book? Or greasy fingers on a page? Blasphemy! If so, favorite reading snack? If I were to snack -- chips & salsa. If it's a text book or my scriptures -- yes. But I have a REALLY HARD time making notes in my novels. I wish I did -- because if I went back to read it, I would like to know my thoughts and feelings, and how they have changed or not. Both -- but I've avoided YA fiction. Hard Copy!! Must have something physical in my hand. No Kindle either! Does falling asleep in the middle of a page count?? :) I TRY to finish a chapter -- because if I don't, I don't remember what I've read. In a perfect world I would say, "Yes, I keep a dictionary by my bed and look up every word." NOT! Pope Joan and The Help -- and they have both been painful. See previous post -- two L.M Montgomery's, Still Alice and Josephine B.
I don't multi-task -- so one book at a time -- unless, of course, you are cramming for book group, and had to put down The Help, to start Pope Joan. 24 hours a day? Oh, yeah, that's not possible. I can honestly say, the only series I've read is Harry Potter. I have SO many books/authors I want to read, that reading a series is redundant. I rarely even read the same author more than once -- unless the name is Austen. Hmmmm....two books I highly recommend from this summer: The Moonflower Vine and These Is My Words. LOVED THEM BOTH!!! I like them to look PRETTY on my bookshelves!! I also group read books and non-read books together.